. . . With Both Hands: Responsible Budget Coalition of SEIU Wants More of Our Dollars - Time For Gov. Pat Quinn to Put Down The Illinois Easter Bunny! Responsible Budget Coalition of SEIU Wants More of Our Dollars - Time For Gov. Pat Quinn to Put Down The Illinois Easter Bunny! I like Pat Quinn and will more than likely vote for him. Governor Pat Quinn is personally honest, liberal to a fault, as loyal as Harry Truman, and as generous a man as God ever made. Pat Quinn also, like too many of my fellow Democrats, believes in the Easter Bunny. The Easter Bunny drops pellets as well as treats. 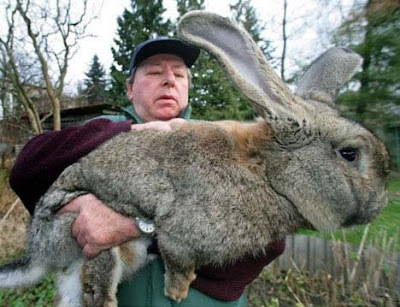 The Easter Bunny in Illinois is dropping turds the size of Bill Ayers' swelled and pampered head -that was a gratuitous insult . . .my pleasure. The treats no longer exist. Illinois is broke. The basket has been looted by Coalitions. These smelly Bunny Budget Boulders are the result of all the Coalitions for More Money from Working Stiffs to Redistribute to Non-Working Stiffs in the Name of Caring and Tender Mercies. Praise . . .uh . . .Praise Jane Addams and all of her Girfriends! Ralph Martire of Center for Budget and Tax Accountability is one such Bunny Belly Sweller. Here's another from Progress Illinois ( SEIU Comic Book) where every Lefty's Kid finds work as a columnist and editor. The Responsible Budget Coalition will celebrate its one-year anniversary this coming week. It's a milestone the group --which includes community organizations, social service providers, unions (including the SEIU Illinois Council, which sponsors this website), and faith-based organizations -- would have preferred not to reach. This wallet lifting Coalition is run by Jon Bouman who looks at working people's wallets like a glutton looks at the Food Channel. Jon Bouman also runs the Sargent Shriver Center for Every Lefty Cause and is also the selected House Mouse of SEIU. Bouman, like elected officials lives off of tax-dollars, because philanthropy is also being murdered by Coalitions. Charitable Giving as well as Business Incentive, is down, because of taxes. Coalitions bully for tax-dollars and charities sseem to hang on like lamprey eels. Jon Bouman whines to the heart strings with that great 70's tune FEeeeeeeeeeeeeeeeLLLIIINNGS moaning in the background. Have a Heart! Pay More Taxes You Racist Class Warriors! He's wonderful! Click my post title and see just who is looking into Illinois working family wallets - There are good causes coalesing with Tax Gluttons. More gluttons than baquet goers. The St. Vincent DePaul Society is a very good and deserving charity, as is El Valor, as is Gadshill, as is . . .however, the list is front loaded with deadbeats and Leftist PACS and Abortion Happy Harpies. Governor Quinn, listen to a plumber, a pipe fitter, a laborer, a 150 Operating Engineers, a Hoister, a Housewife and allow the wax to build up in your ears when you see Jon Bouman shilling for SEIU, "The public will tolerate [the changes] and understand it if they are lead." - Jon "Bunny Boy" Bouman. Pat put the Bunny down - "put it down." Like at the Vet's.